Pro-Change Behavior Systems, Inc. is proud to announce national recertification as both a Women’s Business Enterprise and a Woman-Owned Small Business by the Center for Women & Enterprise, a regional certifying partner of the Women’s Business Enterprise National Council (WBENC). The WBENC certification for women-owned business is the most recognizable and sought after certification of its kind. WBENC’s national standard of certification implemented by the Center for Women & Enterprise requires a meticulous process including an in-depth review of the business and site inspection. The certification process is designed to confirm the business is at least 51% owned, operated, and controlled by women. This certification benefits Pro-Change’s clients by helping them to achieve their diversity initiatives and demonstrating their commitment to fostering diversity. It also provides our clients with a proven well-being solutions partner holding a certification that is nationally accepted by hundreds of major corporations and government entities. Click here to learn more about our inspiring leadership. How can Pro-Change’s Responsible Drinking program meet your population’s needs? Pro-Change is proud to announce the positive outcomes from a rigorous 18-month clinical trial of Pro-Change’s Responsible Drinking program that was conducted as part of a Small Business Innovation Research (SBIR) grant from the National Institute on Alcohol Abuse and Alcoholism (NIAAA). The Responsible Drinking program is a mobile optimized, stage-tailored behavior change program designed for adults who exceed low-risk drinking guidelines. Those guidelines for men 65 and under are no more than 14 drinks per week or more than 4 in a day; and for men over 65 and all women no more than 7 drinks per week or more than 3 in a day. In a randomized trial of nearly 1000 employed risky drinkers, participants receiving the Responsible Drinking program were significantly more likely than control participants to have reduced their drinking to low-risk limits at 18 months follow-up. They were also drinking significantly fewer drinks per week and scored higher on measures of productivity and well-being. Participants in the treatment group rated the program very positively, with over 90% of program users saying they would recommend the program to someone else, that they learned new information, and that it helped them to make changes. 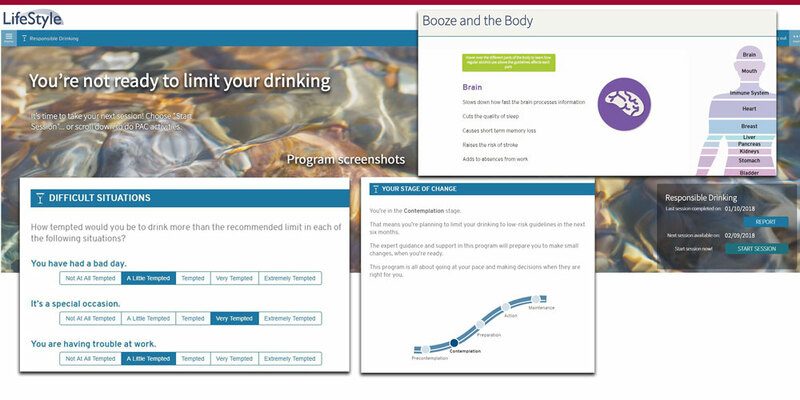 The Responsible Drinking program, which has now been added to Pro-Change’s award-winning LifeStyle Management Suite, consists of 1) an online computer tailored intervention (CTI) sessions with questions and feedback tailored to each individual’s needs, 2) web activities matched to an individual’s readiness to change (e.g. goal setting, cost and calorie counters, ways to get supports, stress management techniques), and 3) tailored text messages. Send us a message if you’d like more information about the program or would like a demo. Acknowledgement: The development of the Responsible Drinking program was supported by Grants #R43 AA017333 and #R44 AA017333 from the National Institute on Alcohol Abuse and Alcoholism. Pro-Change Behavior Systems just completed a major revamp of its proven effective Smoking Cessation program. The Tobacco Cessation program leverages Pro-Change’s innovative and data-driven tailoring technology to customize behavior change guidance for all tobacco and e-cigarette users. Ready or not, program participants receive feedback, interactive activities, and text messages specifically matched to their readiness to stop using all forms of tobacco and e-cigarettes. Like Pro-Change’s other award-winning behavior change programs, the proven-effective Tobacco Cessation program is available in English and in Spanish from any internet-enabled computer or mobile device. Stage-matched guidance at your fingertips! Clinicians now able to assess stage of change in seconds! Pro-Change’s revolutionary Clinical Dashboard now offers clinicians, care coordinators, and health coaches the ability to assess stage of change for a variety of health risks or health behaviors and provide patients with brief, real-time, tailored, evidence-based behavior change tips based on the patient’s readiness to change. The dashboard was designed to help clinicians engage their patients and guide them toward healthier lifestyles. With the new Stage-on-Demand (SOD) capability, the dashboard is optimized to do just that! The dashboard was historically used in conjunction with Pro-Change’s Health Risk Intervention (HRI), providing clinicians an overall view of a patient’s self-reported health status, as well as a behavior change profile and priorities on a single screen. Now with SOD, the dashboard can be used with or without the HRI. So how does Stage-on-Demand work? When a clinician, care coordinator, or health coach pulls up a patient’s dashboard, they see a list of lifestyle behaviors on the interactive display. Simply clicking on a behavior will surface Pro-Change’s validated stage assessment for that behavior, allowing the clinician to quickly and accurately assess stage of change. Once the patient responds, his or her stage of change will be plotted on the behavior change profile, and a brief intervention tip specifically designed to engage the patient in the behavior change process will be dynamically populated into the interface. The decision rules that determine which intervention tips are provided are based on rigorous data analytics and robust behavior change theory, ensuring that health professionals are always delivering the right behavior change feedback at the right moment. Additionally, the dashboard allows clinicians to prescribe Pro-Change’s LifeStyle Management Programs for the patient to work on between visits. Send us a message if you’d like more information, or to see a demo of any of Pro-Change’s well-being solutions, including Stage-On-Demand and the Clinical Dashboard. Pro-Change is proud to announce a re-launch of our on-demand aggregate reporting capabilities for our award-winning LifeStyle Management Suite. Enhanced reports provide aggregated views of overall health and well-being for individuals utilizing our Health Risk Intervention and Self-Management Tools. Key metrics include data on population eligibility, program engagement, health status based on risk profiles, and progress on crucial health behavior changes. Administrators have the ability to generate reports in real time to obtain an overview of their data and trends over time. Risk status across a variety of behaviors are highlighted. The reports allow administrators to gain new insight into the health and well-being of their population. For more information about Pro-Change’s HRI and LifeStyle Management Suite and its reporting capabilities, please contact Pro-Change at info@prochange.com or (401)360-2980. Pro-Change was recently awarded a one-year grant by the Lupus Foundation of America (LFA) to conduct both primary and secondary research which will guide the development of an online self-management program for newly diagnosed individuals with lupus. It’s estimated that there are 16,000 new cases of lupus each year. Lupus is a devastating and life-changing autoimmune disease that currently has no cure. In the United States, lupus is more common in African-Americans, Hispanics/Latinos, Asian Americans, Native Americans, and Native Hawaiians and Pacific Islanders than among Caucasians. The program will be designed to ensure that the needs of those minority groups are incorporated throughout. Our research will include a literature review, analysis of needs assessments and reports, and a landscape assessment of lupus programs and interventions. It will also involve input from content experts, a cultural expert, and lupus patients through interviews, focus groups, and a survey, if needed. Based on this comprehensive research, Pro-Change will issue recommendations for self-management strategies, along with a high-level outline of the intervention structure and content. Dr. Sara Johnson, Co-President and CEO of Pro-Change, will join Laura Putnam, CEO of Motion Infusion, and Crockett Dale, CEO of Healthstat, in an Integrated Benefits Institute-sponsored webinar entitled “Managers on the Move: Why Managers Hold the Key to Better Well-Being at Work”on Tuesday, March 6th at 1 pm ET. For more details, please visit: http://bit.ly/2EVWS4S. Pro-Change was recently tapped by HERO to act as lead research analyst on the recently launched HERO Scorecard Engagement and Retention Study. They will work closely with a multidisciplinary team of experts, including MRA, Inc. who is acting as a consulting statistician, the Institute for Positive Organizational Health, which will conduct a literature review to inform the study, and the HERO Research Committee, who will provide oversight of the study. The research will involve data collected from HERO Scorecard completers between 2014 and 2017. The HERO Scorecard is a free, online tool for employers of all sizes that allows them to assess their wellness program initiatives based on a defined set of industry best practices for improving employee well-being. Companies that complete the HERO Scorecard receive a score for each best practice area, as well as a cumulative score. They also can access national benchmarking data to see how their program compares to other organizations completing the Scorecard. According to Jessica Grossmeier, Ph.D., Vice President of Research for HERO, earlier research demonstrated a correlation between companies that perform well on the HERO Scorecard and those that demonstrate strong financial performance, as well as a connection between best practices and healthcare costs. More recent analyses conducted by HERO Scorecard collaborator, Mercer, identified a relationship between HERO Scorecard scores and employer-reported turnover rates. support for mid-managers and supervisors in attempts to improve well-being. “We are thrilled to be joining this esteemed group of collaborators to examine which specific best practices are most predictive of turnover and perceived organizational support. The results of this study will have important practical implications for employers and health promotion practitioners” said Dr. Sara Johnson, Co-President and CEO of Pro-Change. Exciting changes are underway! Pro-Change recently undertook a rigorous user-centered approach to the redesign of our NCQA-certified Health Risk Intervention (HRI). The result is an updated HRI with a responsive design that embodies simplicity, minimalism, and ease of use. And we didn’t stop there. We infused the same UI design principles into the NCQA-certified LifeStyle Management Suite. With a focus on improving the user-interface of the NCQA-certified Health Risk Intervention (HRI) and the LifeStyle Management Suite, a team at Pro-Change conducted extensive usability testing using validated measures of user experience; refined design options; and conducted A/B testing to inform design choices. The new improvements include a change of font and colors. However, the most noteworthy improvements are the use of text animation, automated question and screen transitions, and content changes to increase readability and usability. Pro-Change will continue to gather feedback on the newly released redesign of the HRI and LifeStyle Management Suite, which is available now for licensing. Experience it for yourself with a free demo! Pro-Change is proud to announce that we have once again been awarded NCQA Wellness and Health Promotion (WHP) Certification for our Health Risk Intervention (a Health Risk Assessment plus Intervention) and Self-Management Tools (Exercise, Healthy Eating, Weight Management, Smoking Cessation, Stress Management, Depression Prevention, and Responsible Drinking). The Health Risk Intervention (HRI) and Self-Management Tools continue to be a central part of Pro-Change’s award-winning LifeStyle Management Suite. NCQA’s WHP Certification process is a quality assurance program to aid employers in selecting wellness providers. NCQA certification identifies solutions that are most likely to deliver on employers’ priorities, such as improving workforce health, increasing productivity, and reducing absenteeism. Pro-Change’s programs, including the HRI, use validated questions to assess readiness to change leading health risks and provide immediate evidenced-based, individually tailored feedback about the strategies individuals can use to make progress on reducing their specific risk behaviors. Pro-Change’s programs continue to optimize individual well-being, reduce health care costs, and increase productivity. WHP certification is an acknowledgement that Pro-Change’s HRI helps individuals manage their health. In addition to the individual-level feedback and personalized text messages that users receive, the HRI has the ability to provide high level results to employers through a sophisticated aggregate reporting function. Pro-Change continues to ardently protect the users of its programs, with the HRI clearly disclosing how any information from the HRI may be used and how we protect their privacy. NCQA certification for Pro-Change’s Self-Management Tools guarantees that we continue to provide evidence-based self-management tools to help individuals manage their health. The NCQA standards address important health topics; call for periodic testing to make sure tools are usable and understandable; require review and update of tools to reflect changes in evidence; and require Pro-Change to make tools available in different formats. “Receiving NCQA certification again for our Health Risk Intervention and Self-Management Tools is a reflection of Pro-Change’s ongoing commitment to disseminating effective evidence-based behavior change solutions,” stated Sara S. Johnson, PhD, co-President and CEO of Pro-Change.